Valid for purchases made on 12 Dec, 9pm - 12 Dec, 11.59pm. Please note that visuals are for reference only and may not be the actual products. The winner will be notified by Friday 31 Dec 2018 via ShopBack's Facebook page. ShopBack reserves the right to decide the final winner. Joyce is the 1st person to check out & make payment of an Expedia order at 12 midnight on 12 Dec, she wins an Apple Watch Series 4. Tricia is the 1st person to check out & make payment of a Taobao order at 12pm on 12 Dec, she wins an Amazon Kindle Paperwhite. Valid for purchases made on 12 Dec, 00:00 - 12 Dec, 11:59. 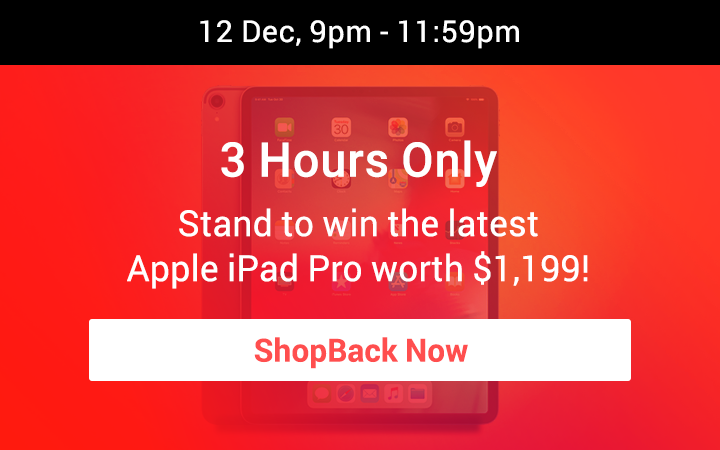 Winners will be notified by Friday 31 Dec 2018 via ShopBack's Facebook page. The qualifying time is the transaction time of the purchase, with a valid and recorded clickthrough via ShopBack. The user must successfully complete their payment at 12 midnight or 12 noon to win a prize. ShopBack reserves the right to decide the final winner based on the transaction time of ShopBack’s records.